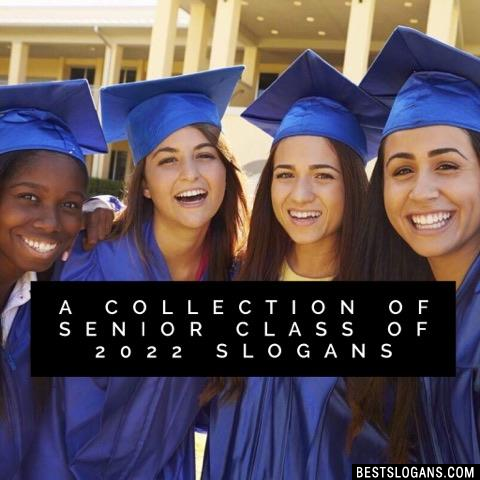 78 new entries added to senior class of 2022 slogans for shirts, that include pictures. 1. Who? Class of 2022! 1 Who? Class of 2022! 2 We're the 2022s You've Been Waiting For. 3 We're Super Fresh, Like Mr. Clean. We're The Class of 2022! 4 We're Not Done Til It's 2022! 5 We're makin the grade, we're livin the dream, Class of 2022 reign supreme. 6 We're Living the Dream. We're the Class of 2022. 7 We're good as gold, we're oh so bold, class of 2022 breaks the mold! 8 We Swerved. We Twerked. Now We Gotta Find Work. Class of 2022! 9 United We Stand. Divided We Fall. Class of 2022 Got It All. 10 Truth be told class of 2022 breaks the mold! 11 The Class of 2022 Stuns. 12 The class of 2022 is divine. Shout it loud and make it shine. 13 The Class Of 2022 Is A Blast, A Class Like Ours Is Unsurpassed! 14 The best you've ever seen, class of 2022! 15 Take it back and hold it true. 2022 belongs to you. 17 Step aside while we rock the scene. Class of 2022 reigns supreme. 18 Step Aside While We Rock the Scene Were The Class of 2022. 19 So much hassle for 2022 tassel! 20 So Fresh, So Clean, We Are The Class Of 2022. Can you think of a good Senior Class Of 2022 Slogans For Shirts we're missing? Or come up with a clever one of your own. Please share below.